Indulge yourself with one of our dazzling Spa Day packages. Try a back massage, manicures or enjoy a full body wrap with exfoliation all with access to Saunas, Hydrotherapy Spas and a steam room. We have a glittering range of treatments for you to choose from, all carried out by our expert therapists who only use products from the very best brands so you can be confident you will be back to your radiant self again! We also offer a light bite menu with a selection of hot and cold food, as well as refreshments including the world famous Illy coffee. Afternoon Tea & Cream Tea now available for pre-booking with your Spa Day package. 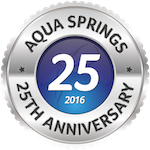 If you have a Health & Fitness membership with Leisure World not only do you benefit from unlimited use of the Activa Gym, our excellent fitness classes and swimming pools, you also have unlimited use of our amazing spa facilities at Aqua Springs. Our range of fantastic treatments are also available separately and can be booked by calling 01206 282100. To join online, the site selected must be Leisure World Colchester.